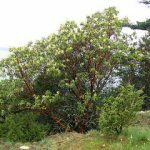 This nature segment focuses on the Pacific Madrone, a berry producing local tree. KBCS’s Yuko Kodama recently took a walk in Seattle’s Seward Park with Ed Dominguez, Audubon Center Lead Naturalist, to discuss the unique characteristics and history of this tree. Find out about its name and red berries, which are eaten by many animals.